Art often idealizes the human body, sidelining messy reality. Imagine entering a museum only to recognize on display a disease or disability that you've struggled with. 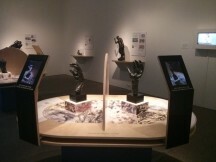 This experience is now available to sufferers of Apert syndrome, Dupuytren's contracture and a variety of other maladies at "Inside Rodin's Hands: Art, Technology, and Surgery." This unusual exhibit, running April 9 – August 3 at Stanford's Cantor Arts Center, is a collaboration between one of the world’s largest Rodin collections and preeminent medical schools. Auguste Rodin was famous for departing from traditional mythological figures to create more realistic forms. 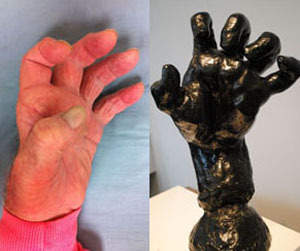 He may well have been inspired by human injuries and imperfections; for example, his sculpture "Large Clenched Left Hand" appears to have Charcot-Marie-Tooth—a genetic disorder that damages the nervous system, killing muscle tissue and deforming extremities. Left: hand deformity caused by Charcot-Marie-Tooth disease. Right: Large Clenched Left Hand by August Rodin. "It's striking for somebody like me who sees people with CMT quite often, and quite often the older people have that distinctive hand posture. It's remarkable to see it cast in bronze," says Rick Alber, a San Francisco resident who became involved with the local CMT support group when his daughter was diagnosed with the disease. "Large Clenched Left Hand" may or may not be actually modeled on the hand of someone with CMT. Dr. James Chang, the Stanford hand surgeon whose thought experiments inspired the exhibit, points out that the diagnoses are "pure conjecture." But it's worth noting that Jean-Martin Charcot, one of the three doctors who first identified CMT, was in Rodin’s social circle. According to Bernard Barryte, curator of the Cantor's Rodin collection, "Given their association, it is possible that Rodin saw a victim of [CMT] in connection with Charcot. However, it is just as likely that Rodin independently saw someone with this disease, found the configuration of the hand fascinating and expressive and modeled it." CMT causes the nerves farthest from the brain and spine to deteriorate, first in the feet and legs and later in the hands. The nerves lose their ability to transmit signals and activate muscles, and as anyone who's worn a cast knows, unused muscles atrophy. In CMT, this creates deformities such as the claw shape recognizable in Rodin's sculpture. Over time, says Alber, "Your hands and feet become tingly, numb, and weakened. The bottoms of your feet get cuts and blisters and things you can't feel." Lots of muscles mean lots of things can go wrong. 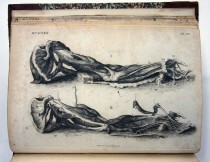 Plate 6 from John Bell's Engravings of the Bones, Muscles, and Tendons (London, 1810), on display at the "Inside Rodin's Hands" exhibit. Symptoms of CMT aren't usually obvious until adulthood, and like all genetic diseases it tends to run in families. But one of CMT's hallmarks is unpredictability, in part because it can be caused by many different genetic mutations. Says Alber, "One person might be a bit clumsy. Another person is in a wheelchair at age 12." His daughter didn't inherent a diseased gene from either parent—her body invented it from scratch with what's called a de novo mutation. And although she was diagnosed in early childhood, the disease's progression has so far been slow. Now 23, she works at a Jamba Juice in San Francisco. CMT can’t be cured like an infectious disease, because every cell in the body has the same mutated gene. One real but distant possibility is gene therapy, in which functional copies of the affected gene could be delivered directly to the damaged nerves and muscles. In theory, the body could then use these genes to build the missing proteins and repair the damage. Meanwhile, treatment options are limited: physical therapy, orthopedic braces, sometimes surgery. For years, Rodin's art has been aiding Stanford doctors and medical students to think in three dimensions as they learn to identify and treat the underlying medical conditions. 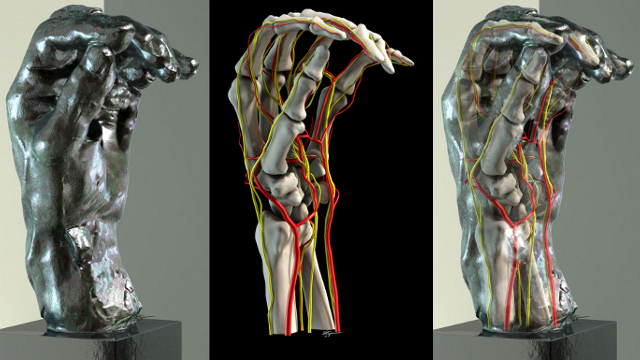 The sculptures inspired Dr. Chang to create an undergraduate class titled "Surgical Anatomy of the Hand: From Rodin to Reconstruction" in which students diagnose a sculpture and develop a treatment plan. Samuel Cohen Tanugi, who took Dr. Chang's class in 2010, described "Large Clenched Left Hand" as a result of damage to two nerves in particular, the ulnar nerve and the median nerve. He wrote, "Reconstruction would require complex nerve and tendon transfers to rebalance the hand into a more normal posture." Dr. Chang will give a free public lecture about the exhibit on May 29th at 6:30 p.m. in the Cantor auditorium. Admission to the exhibit itself, as to the rest of the Cantor Center and sculpture garden, is also free.